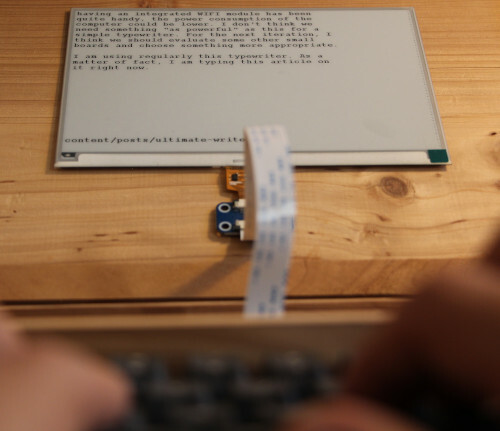 Ultimate Writer: an Open Digital Typewriter with eInk and @Raspberry_Pi @ninjatrappeur « Adafruit Industries – Makers, hackers, artists, designers and engineers! Easily readable e-ink screen. You can read it effortlessly even in sunlight. Long lasting battery life. You can have a 3 days off the grid writing retreat (~20 hours) without having to recharge it. Easily serviceable design. Your typewriter is 40 years old and works just fine. You don’t want to change your writing device every 5 years. You want to be able to easily change the computer parts easily; and who knows, use something else than a raspberry pi. Standard OS. You want to use your favorite console-based text editor. You also want a shell access to tweak your setup without reprogramming the device. This is a beautiful build with a wood case, real keyboard, and eInk goodness. See the build details on the alternativebit blog.